When I took my permaculture design course in 2010, there were a few permaculture design elements that seemed easy to incorporated into most gardens. Herb spirals are one of them. Because of this, I have been careful not to overuse them in my landscape designs. 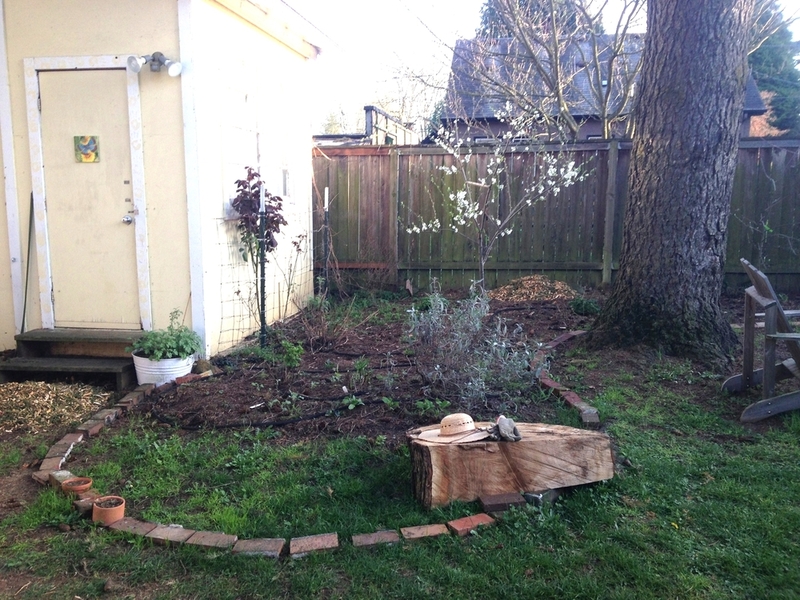 In fact, I hadn't included an herb spiral in a design until I expanded my own medicinal herb garden this spring. What is an herb spiral? Herb spirals maximize garden space by coiling up a linear garden space into a mounded spiral. Built with some elevation, herb spirals offer various micro-climates. Each side of the spiral receives a different amount of sunlight and the soil moisture fluctuates as it moves down and around the spiral. Herbs are planted along the spiral according to their sun and moisture needs. This compact design is easy to access for harvesting and adds a unique and beautiful element to any garden. Our backyard is designed with a lot of big looping curves, creating wonderful nooks and crannies for seating areas, play areas, and veggie gardens. When I was dragging my garden hose around, trying to decide how much space I wanted to add to my medicinal herb garden, the bubbled-out curve I chose was the perfect size and shape to nestle in an herb spiral. Step 1: Use a garden hose to play around with bed lines. I found a curve I liked then laid bricks down to mark the space while we tested out the proposed line for a couple weeks. Herb spirals are mounded up in the center and spiral down to ground level at the bottom. As with all garden projects, there are many different ways to build an herb spiral. You could bring in enough topsoil and compost and build the whole spiral with that or even add a space filler (like a few large rocks) in the center so you don't need to bring in as much soil. Since we are on a budget and I prefer to use free or found items, our herb spiral features a lot of different materials. The large section of log in the picture above was hauled over by wheelbarrow from a house two blocks away and the wood chips in the photo below were delivered free of charge from a local arborist (we shared about 12 yards of wood chips with our neighbors). I am also a lazy gardener (one of the great benefits of permculature gardening, by the way!) and decided a long time ago that I do not enjoy digging up grass. To get rid of the grass, I covered the area with cardboard boxes. The boxes, with organic matter piled on top, will easily smother the grass. This method is also great because I'm not losing precious topsoil by removing the grass. My next step was to dig up my existing plants then situate the large log and other smaller logs (that came with our free wood chip delivery) in the center of the herb spiral. Building a garden over logs or branches is a permaculture technique called hugelkultur. Some benefits of hugelkultur include moisture retention, increased soil micro-organisms and organic matter, air pockets, and a slightly warmer bed as the wood decomposes. Step 2: Lay down cardboard to smother the grass. Add logs as filler and to create a hugelkultur garden. I then hauled in several wheelbarrows of wood chips to begin raising the elevation of the spiral. With the wood chips mounded in the center, I gathered some materials to create the spiral. If you like a neat garden with matching materials, shop for large rocks (about 12-18" across). If you're like me and don't mind piecing things together, use what you already have. Starting at the lowest end of the spiral, I adjusted the wood chip mound and used logs, rocks, and bricks to create the spiral shape. 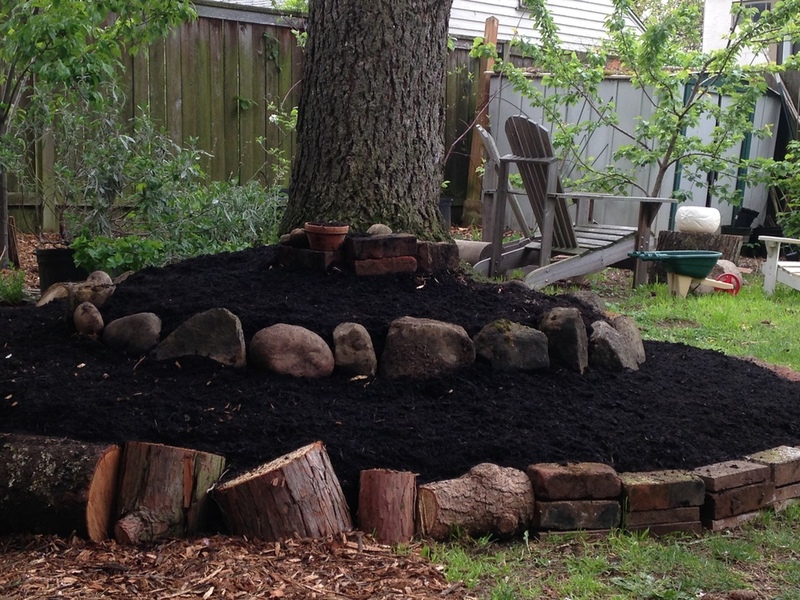 Step 3: Add wood chips and create a mounded spiral with rocks, logs, bricks, etc. 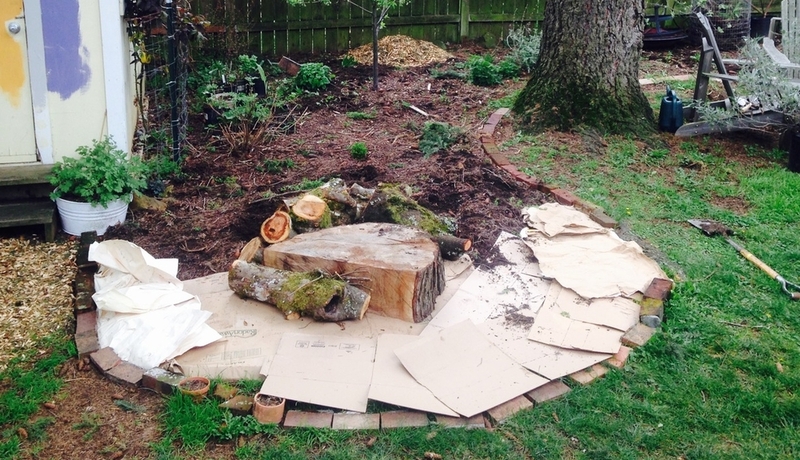 With my hugelkultur / sheet mulch materials in place and the basic shape constructed, the next step is to add compost. I ordered a few yards of compost and added 6-8" to the entire spiral. This thick layer of compost built up the height of the spiral and allowed me to plant directly into the new garden, without waiting for the wood chips to break down. The last step is to plant your herb spiral! I chose nearly all medicinal plants for my garden. I had almost enough plants to fill the entire garden. I still need to transplant a few echinacea and ginger and plant calendula, wild arugula, and chamomile seeds. Since many of my plants are still pretty small, I plan to fill in the gaps with some smaller annual vegetables such as bush beans, lettuce, greens, onions, carrots, beets, turnips, cabbage, etc. I prefer to maximize my growing space and this garden, topped with rich compost, is the prefect space to do that! I'd love to hear from you! Do you have an herb spiral or have you been inspired to build one? Have you tried hugelkultur or sheet mulching?